Presidents Choice Does it Again! I LOVE food…and I really LOVE trying new products, especially when the quality and price are right. 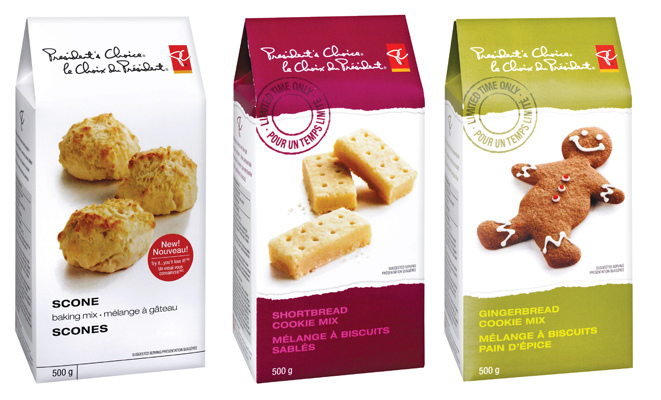 President’s Choice Products never fail to impress me, and for the years and years I’ve religiously used them, the company keeps coming up with better ideas for sensational new products every year. The holiday season always brings with it a plethora of amazing new things to try for both entertaining and day-to-day meals as well! This evening, as I was sitting in bed perusing the PC Insider’s Report, I was literally drooling! It’s pages were full of beautiful product descriptions and photos which made me want to try it all! Particularly intriguing to me were the new PC baking mixes for “Holiday baking in a hurry.” As the writer of a web-site focused on cooking and baking, I am often told by my readers “I just can’t bake.” Well my friends, I think these mixes should take the guess work out of it for you, and make every baking session a complete success from here on in. The baking mixes such as gingerbread, shortbread and decadent Belgian chocolate squares look completely delectable, very affordable, and above-all, EASY. How can you possibly go wrong when the hard part is already done for you? I can’t wait to try these mixes and review them for you. As someone who does bake a lot, I must say, there is a definite appeal to the simplicity of these mixes in terms of the time-savings. If you’ve tried any of the brand new PC baking mixes, let us know what you thought of them. To me, they all look like winners!